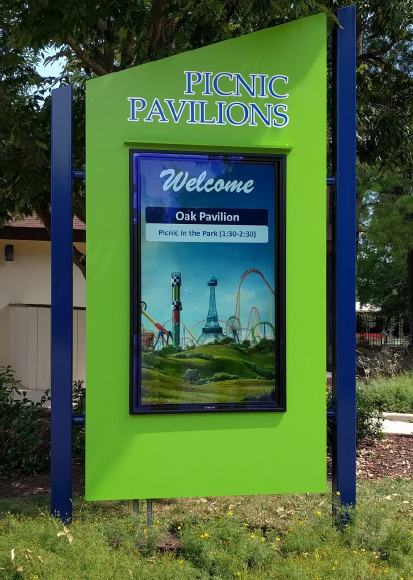 Kings Dominion, Virginia’s premier amusement park and home to the world’s longest floorless coaster, updated their Picnic Pavilion with digital signage powered by Mvix. The screens – all of which are networked and remotely controlled – display picnic reservations, directions to the picnic locations, personalized welcome messages for picnic guests, listings of future park events, and promos for park rides and concessions. Kings Dominion has been a Virginia landmark for more than 40 years. Located less than 30 miles north of Virginia’s capital Richmond, the 400-acre amusement park is consistently ranked among the best in the country. The park receives just over 2 million visitors annually who come to enjoy over 60 rides and attractions, including 13 roller coasters, a 20-acre water park, and an annual Halloween Haunt. Even with such a high volume of visitors and attractions, Kings Dominion has consistently maintained less downtimes and shorter wait times. The amusement park also features the world’s largest PEANUTS™-themed children’s area with 20 rides, upgraded food locations, multiple event spaces and more. In addition to rides and attractions, Kings Dominion has a Picnic Pavilion that sees hundreds of guests a day, with a majority of them being corporate events and group activities. The pavilion boasts five sheltered picnic spaces, each with a maximum occupancy of 100 visitors, as well as a central amphitheater for concerts and performances. To increase group sales, Kings Dominion needed to upgrade their Picnic Pavilion with technology that will radically redefine the look, set the mood and fuel the environment. The reader boards that were in place were not only small and couldn’t be read from far, they were also difficult to read in direct sunlight. They made the pavilion look outdated. Changing the content being displayed was also difficult. In addition to that, display options were limited to scrolling text or static text. Keeping these challenges in mind, Kings Dominion wanted a visual communication solution that was easy to update and customize. They needed to be able to make changes and have the screens updated instantly. The Marketing team, who was responsible for the content, needed to control the screens remotely from their offices across the park without there being any content gaps. Additionally, the digital signage system had to be weather resistant and easy to read in direct sunlight. Kings Dominion installed 10 outdoor signage displays in the Picnic Pavilion. Ron Sprouse, the Lead of Tech Services at Kings Dominion, selected Mvix for their industry experience and proximity to the park. His team found the software to be very intuitive and easy to pick up after only a few training sessions. The displays were outfitted with anti-glare tint and weather resistant enclosures that were also temperature controlled. Each enclosure includes 5 fans to let air in and out. The fans automatically turn on at 90 degree temperature. At the main entrance, the digital signs welcome guests and display the day’s picnic reservations. Further down the pavilion, a second display lists the picnic spaces, current vacancies & occupancy, and provides directions to the picnic spaces. Each of the 5 enclosed picnic areas has a display showing current guests and the allotted time. Guests can also use the displays for their own events e.g. a corporate group may display the picnic menu, a listing of activities for the day, company logo and other branding elements, social media, trivia etc. All displays also feature countdown clocks to big events in the park, including concerts and performances scheduled at the amphitheater in the pavilion. Native content integrations in the signage software allow the marketing team to easily display dynamic content such as weather, traffic, date & time, social media, news tickers, and even emergency alerts alongside picnic info. Kings Dominion also integrated their scheduling software with the signage software to automatically pull and display reservations. When the schedule is updated, the screens are automatically updated. 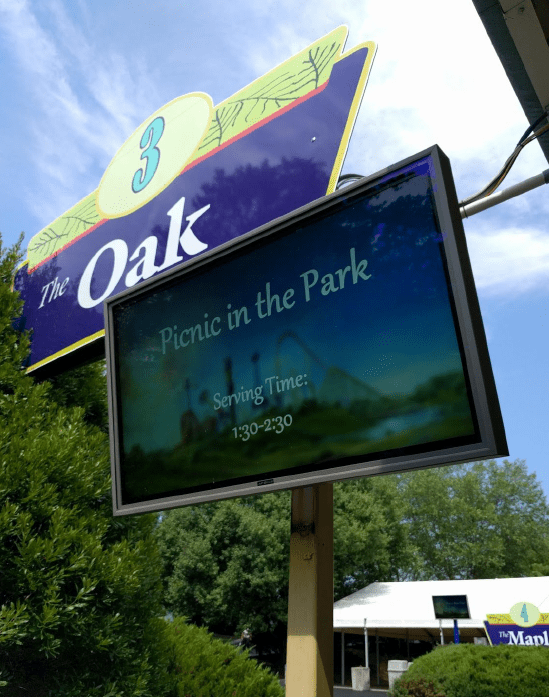 The outdoor digital signage displays have modernized park communications and the picnic experience. The Kings Dominion brand is powerfully expressed and communication goals are more fully achieved. 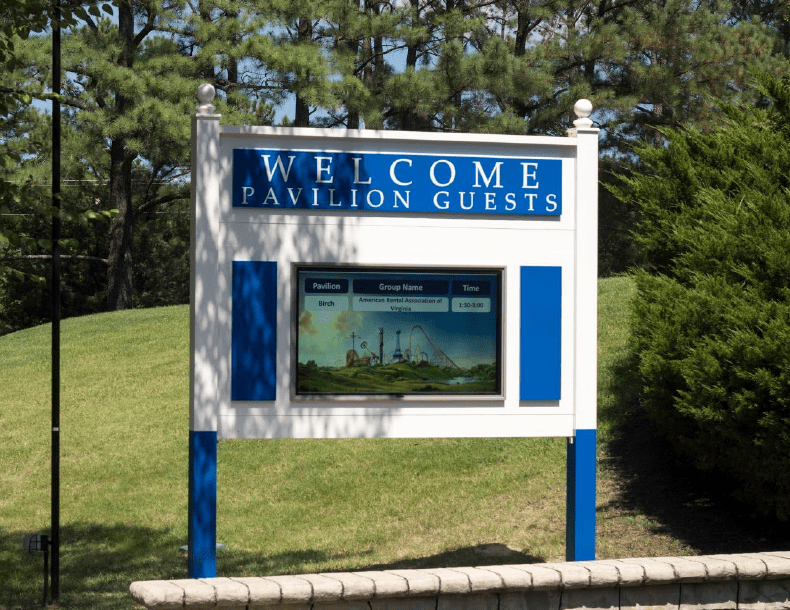 The new digital signage network is helping Kings Dominion realize their goals for the picnic pavilion. The inclusion of the digital signs allows them to offer elevated picnic experiences which has boosted picnic revenues. The team has also noted improved guest satisfaction. The customized welcome messages offer a layer of personalization that appeals to guests. The ability for guests to use the screens during the picnic makes for elevated experiences that are memorable and that foster repeat customers. The digital signs also helped to elevate the brand image. They have radically redefined the look of the Picnic Pavilion with a great deal of dramatic impact and visual appeal. The pavilion appears more streamlined and modern, which is a look that has improved the perception guests have of the park. The workload of the marketing team has also been significantly reduced. The need for static signs has been eliminated completely. The marketing team can send information to a bank of networked displays from the office with just one click. Content integrations allow them to display more information with less effort. They’ve also noted that park guest are able to find their way around the pavilion easier, freeing up park staff to focus their full attention on guest satisfaction. The outdoor signage network has refreshed the Picnic Pavilion space and has helped to facilitate memorable experiences for park guests. Our focus is on cost-effective, feature-rich, cloud-hosted solutions that, coupled with our engineers and creative team, build digital signage networks that turn browsers into customers and employees into brand ambassadors, all while enhancing brand awareness. Our software, XhibitSignage , recently won the InfoComm 2017 Best of Show Award – Digital Signage. Kings Dominion is a 400-acre amusement park, home to the world’s longest floorless coaster. Located less than 30 miles north of Virginia’s capital Richmond, the 400-acre amusement park is consistently ranked among the best in the country. They see over 2 million visitors annually and manager over 60 rides and attractions, including 13 roller coasters, a 20-acre water park, and an annual Halloween Haunt.